I have just purchased this beautiful print of a Murray cod. It is a dry-point etching, by Clare Whitney, a Melbourne based printmaker and painter. Murray cod is raised in fish farms and is rare in the wild, but this was not always so. If however the country itself is poor, the river is rich in the most excellent fish, procurable in the utmost abundance. Murray cod is Australia’s iconic, freshwater fish, once found naturally thorough-out most of the Murray-Darling River System. It is a native fish, which features strongly both in Aboriginal mythology and Australian folklore, though it is called by different names. It provided food to Aboriginal Australians and early settlers, but later suffered a significant decline due to overfishing and environmental degradation. In the 1950s, annual catches were still above 150,000 tonnes and Australians were proud of this fish – in 1954, Queen Elizabeth and Prince Philip were presented with Murray cod at a State Banquet at Parliament House on their first visit to Australia. There are many tales told by anglers, who are reputed to have caught enormous fish. Unfortunately, these stories may be true. Murray cod can live for up to a century, grow more than a metre long and weigh more than 100kg (the biggest on record was 1.8m long, weighed 114kg and was over 100 years old). The major problem the cod face today is the inconsistent supply of water in the Murray-Darling River system, partly due to the prolonged drought and exacerbated by the amount of water taken from the river (regulated by locks, removed for irrigation), which has altered the river flow and the shape of the river. This has resulted in changes of habitat and adverse conditions for breeding. The introduction of redfin perch in the 1950’s (carnivorous predators and competitors), followed by the European carp, and the use of toxic chemicals from farming practices have all compounded the impact on the stocks of Murray cod. Although different states operated on different premises and priorities some positive strategies were initiated and have been supported by the Australian Government since the early 1980’s to help the cod recover. These include: improved fisheries and environmental management and protection of stocks through fishing regulations; imposed closed seasons for fishing; breeding and release of hatchery-reared fingerlings. While these approaches have contributed to some increases in numbers in certain parts of the river system, the drought (some are calling it the worst in 1,000 years) is now adding further stresses. Murray cod is being successfully grown in pond culture and tank-based re-circulating systems and is regaining the status it deserves as a superb tasting fish. It is difficult to purchase, although it seems to be available in certain restaurants (in Melbourne). Murray cod is particularly appetizing– baked, pan fried, poached or steamed. The Ngarrindjeri people of the lower Murray have a Dreamtime legend about Ponde, the great Murray cod that helped form the Murray River and the waterways all the way down to Lake Alexandrina (in the south East of Adelaide in South Australia). Ponde was chased by one of the men from the Ngarrindjeri tribe, but Ponde was so big and fast that when he swam, he carved out the existing little river into a very large waterway known as the River Murray, complete with cliffs and bends. The persuer’s brother- in-law also joined in the chase and when he caught him in Lake Alexandrina he cut Ponde into little pieces. These became the different fish – mulloway, mullet, bream and others, once plentiful in the Coorong (The Coorong is a unique, long shallow pool of salty water, stretching for over 100 kilometres from the Murray mouth up to Lakes Albert and Alexandrina. – unique for its beauty, its isolation and once, for its abundance of fish and bird life). Food cooked in padella, (‘n or `na padedda in Sicilian) is cooked in a fry pan. This is generally the culinary term used for sautéed, shallow frying or pan-frying. The method is relatively fast and the medium to high heat required is easily controlled. It suits almost any whole fish (river or sea), fillets or cutlets. Cooking time will vary depending on the thickness of the fish and whether you prefer the fish to be cooked through. I often find that when I use my heavy based frypan instead of my non- stick pan, the cooking is faster, the fish is crisper and the juices left in the pan are more caramelized and tasty. 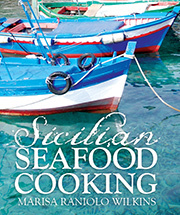 The original recipe is for river trout (Trout is caught in the Manghisi River near Noto, which is not far from Ragusa). It is cooked with wild fennel, green and black olives and very thin slices of lemon. Fresh thyme is also a strong flavouring and can be (probably needs to be) substituted for the fennel. I have also used fresh dill (more Greek than Italian). Do buy good quality olives to get the real intended flavour!! Need I also say that there is ‘good salt’ and that ‘freshly ground pepper’ is best. This method of cooking fish can be used to cook either whole small fish or any fillets or cutlets. Murray cod is difficult to get – ask your fish vendor. Suitable fish: red mullet, mullet, sand whiting, flathead and garfish, trevally, kingfish and albacore tuna. Murray cod (farmed) and barramundi (grown in a fully closed system of aquaculture or accredited, line wild-caught, snapper if line caught (better choice). Snapper, blue-eye travalla and mackerel are from the (think twice) category. See previous post: Where I buy my sustainable fish. 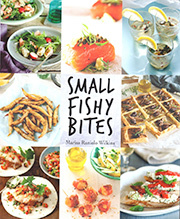 Categories from Australia’s Sustainable Seafood guide- www.amcs.org.au . • The green feathery part found at the top of the cultivated bulb fennel. • Bulb fennel cut vertically and very thinly sliced. Heat the extra virgin olive oil in a frying pan and pan fry the fish, add a little salt. and pepper. olives, saffron, herbs and lemon slices and heat through. Return the fish to the pan and toss it around in the hot ingredients for 1 minute and serve. 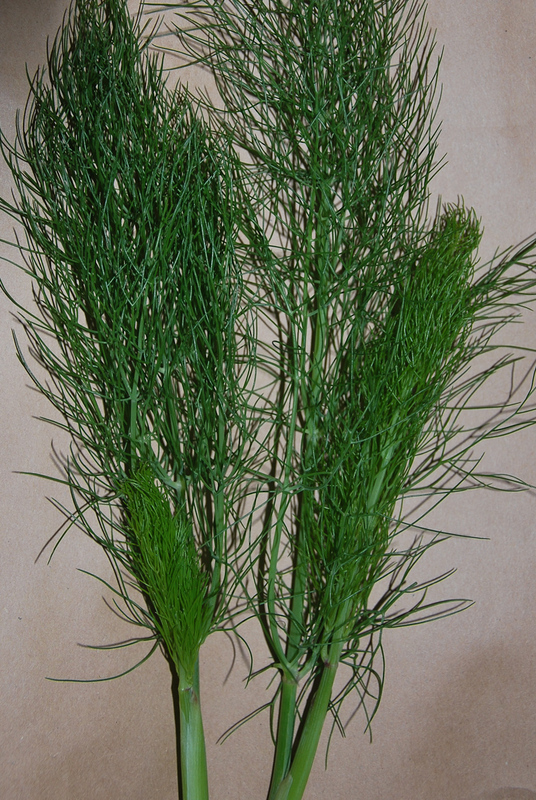 Wild fennel is frequently used in Sicilian food to add a particular aniseed taste to many dishes. It can be cooked (see recipes for Pasta con le sarde and Ministra di finocchio e patate ) or added raw like any chopped herb, for example as in an olive or an octopus salad. The seeds are also used, for example scattered on bread before baking or to flavour marinades and preserves. 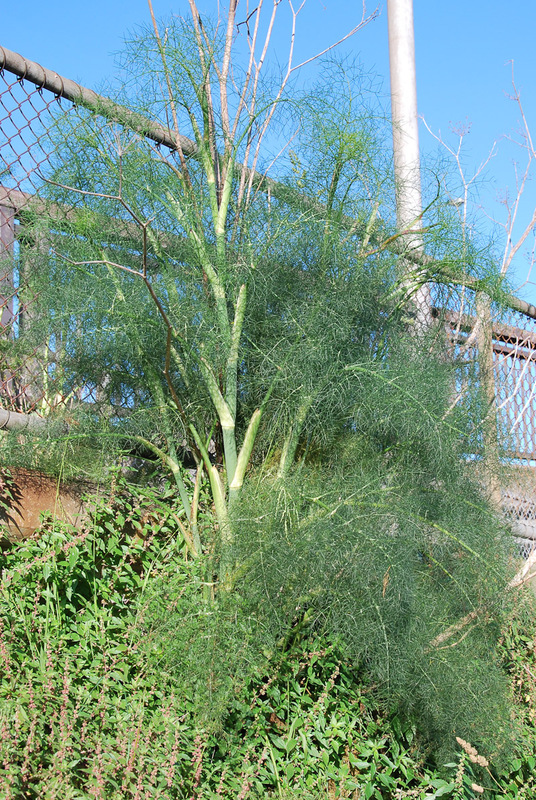 These photos of wild fennel were kindly sent to me by one of my readers who lives in Philadelphia. She has travelled to Sicily several times and has also attended cooking classes there. She is aware about the differences in flavour between wild fennel and the bulb fennel. Since coming back from Sicily she has found a good source for wild fennel seeds and they are sprouting well in her North American garden in an apartment complex. The gentleman in the blue work suit is holding wild fennel. We picked lots of it. 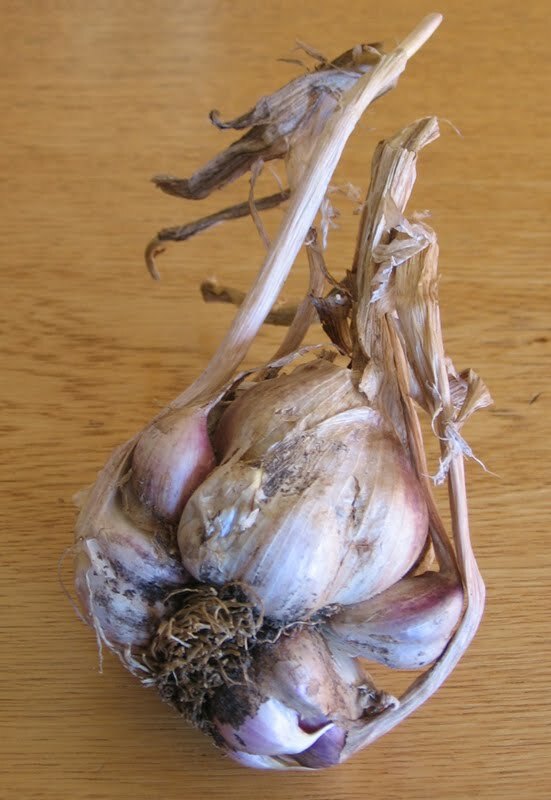 My understanding is that you never eat it raw and that the “frilly” part at the top has tons of flavor unlike the typical fennel I find here with the large bulb where the frilly part has almost no flavor at all. I don’t think wild fennel has any bulb at all. It appears if anything, more like celery in that it is a simple stalk except with the frilly parts at the top.